By Peter Anderson Leave a Comment - The content of this website often contains affiliate links and I may be compensated if you buy through those links (at no cost to you!). Learn more about how we make money. Last edited December 13, 2018 . My family is all about finding ways to save money on our regular monthly expenses, and before we switched to a lower cost provider a few years ago, one of our larger monthly costs was for our cell phone bill. A recent survey by Cowen and Company found that if you're with one of the big 4 traditional cell companies, you're likely paying in excess of $90/month or more for service! While the costs many people are paying for service is horrendous, these days there are alternatives. The above survey doesn't include pre-paid cell or other low cost providers that have popped up over the last few years. If you're with one of those services, your costs are likely to be much lower. 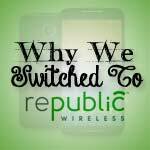 We've been on the no-contract cell phone bandwagon for years now, and for the last year and a half or so we've been with Republic Wireless. 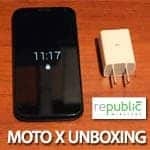 I received a Moto X (2013) 1st Generation smartphone from the folks at Republic Wireless in order to do a review of the service. 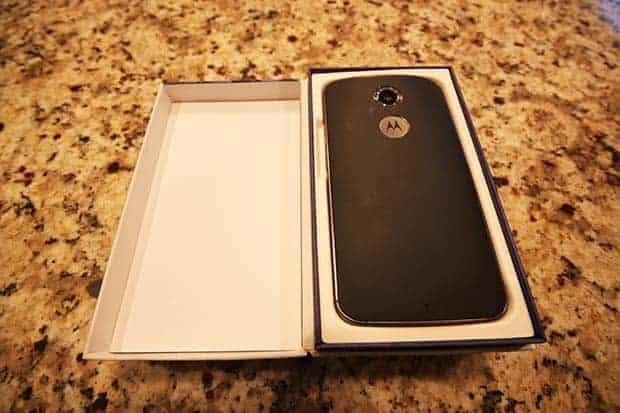 After trying it out we loved it so much that we got a second Moto X (2013) for my wife. When my Moto X started having issues recently (probably after being dropped by my son one too many times), I decided to jump in and buy the latest and greatest flagship phone from Republic Wireless, the new and improved 2nd Generation Moto X (2014). This post will give you an in depth look at the phone. So let's get started. 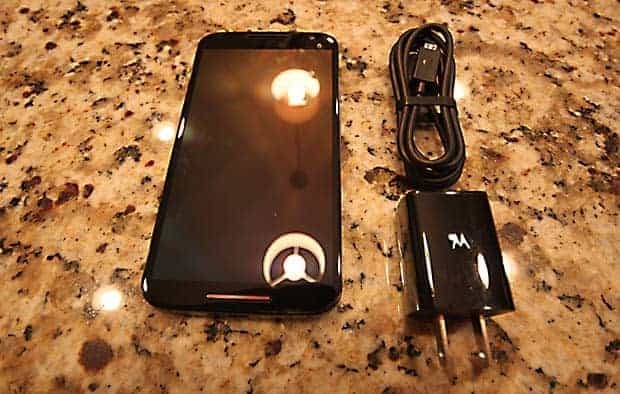 Moto X 2nd Gen & Republic Wireless: An Amazing Phone & Service! Republic Wireless has been around since 2010, and they typically receive glowing reviews from people who use their service (like me!). People love the fact that their cell service can be affordable – and that they can pay based on what they use when it comes to mobile data. So how is Republic able to keep their service so affordable? By taking advantage of prevalent Wi-Fi connections that are everywhere these days, and leveraging those connections through their use of a hybrid Wi-Fi/cell calling technology. Their Hybrid Calling technology allows them to route voice calls over WiFi networks, and if one isn't available, then calls will go over the Sprint cell network (or Verizon’s network if Sprint is not available). Republic has perfected the technology to allow for seamless Wi-Fi to cell handovers – allowing you to start a call on Wi-Fi and move to a cell connection if you're no longer in range of Wi-Fi. All this to say that Republic has created a new phenomenon in hybrid cell/Wi-Fi calling – to the degree that the bigger providers have taken notice. Many providers have recently started allowing for Wi-Fi calling, although none have completely perfected the seamless Wi-Fi/Cell handovers like Republic has. For many they only have the option of one or the other (Wi-Fi or Cell) with no handoffs mid-call. Google recently launched a mobile phone service called Project Fi that is a near clone of Republic's service, although for lower users of data it's still likely to be more expensive. 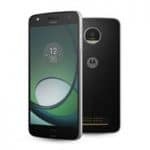 I wrote a full review of the Republic Wireless service here if you'd like to check it out, but let's just say that I love the service – and am excited to continue using the service with my new phone – the Moto X 2nd Generation. 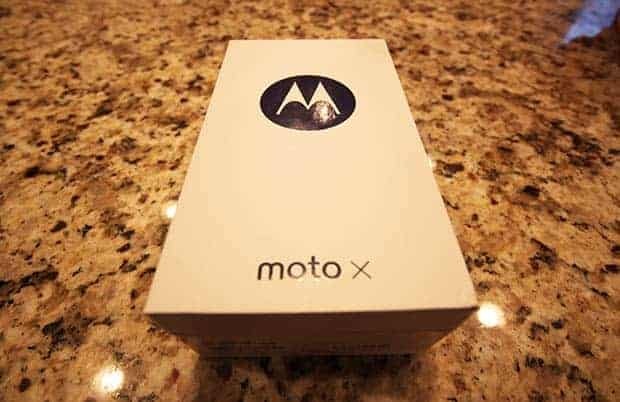 The phone that we just received via FedEx is the $249 Motorola Moto X 2nd Generation, also called just “Moto X (2014)”. It's an extremely well reviewed phone that has been one of the hottest Android phones since it was released in late 2014. Up until a few months ago it cost $399, so it's a big bargain now at $249! 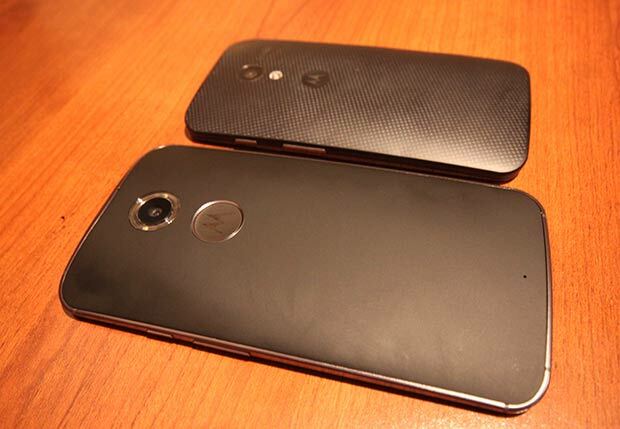 The Moto X 1st Generation, or “Moto X (2013)” was well received as well – receiving several “phone of the year” awards. The Moto X (2014) is by many accounts a much improved phone. 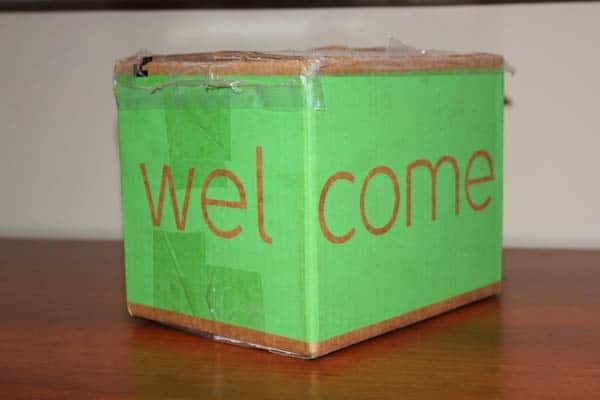 After ordering your Moto X via the Republic Wireless site your phone will arrive in a decent sized green package. 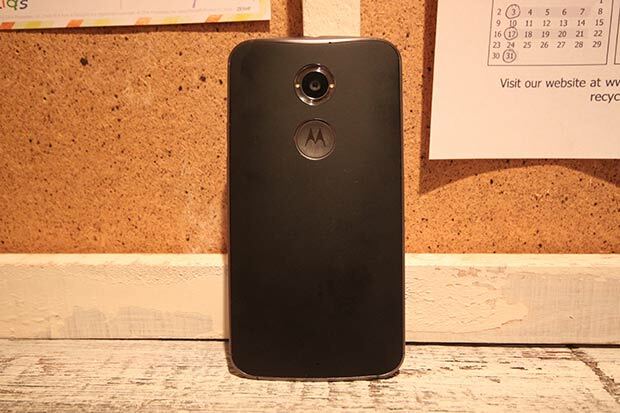 Inside the flaps you'll find a small white box with a nice “M” logo on the top, and “Moto X” at the bottom. The Moto X 2nd Gen is a beautiful phone. It has an amazing full HD screen, a nice matte rubberized finish on the rear, and the rounded back fits nicely in your hand. Another nice touch is that the 2nd gen phone is wrapped in a metal band, that not only looks nice, but also helps to improve reception for the phone. The phone just feels like a quality, high end phone. The rear facing camera has a great 13MP camera, that includes a ring flash with dual LEDs around the camera lens. That means you'll get some better illumination on your photos than on the previous generation. You can also now capture Ultra HD and slow motion video, which should be fun to use. The first thing I noticed in my tests of this phone was that it had better performance than any other phone I've ever owned. Apps open super fast and there was never any lag in anything I ran. Even video intensive games and apps seem to run buttery smooth. 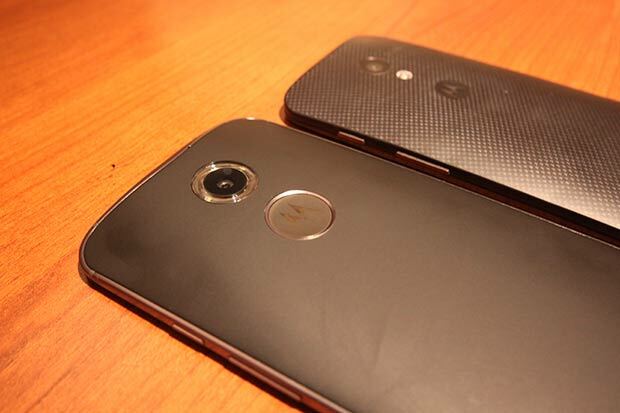 The Moto X (2013) was no slouch, but the Moto X (2014) does have some nice upgrades. 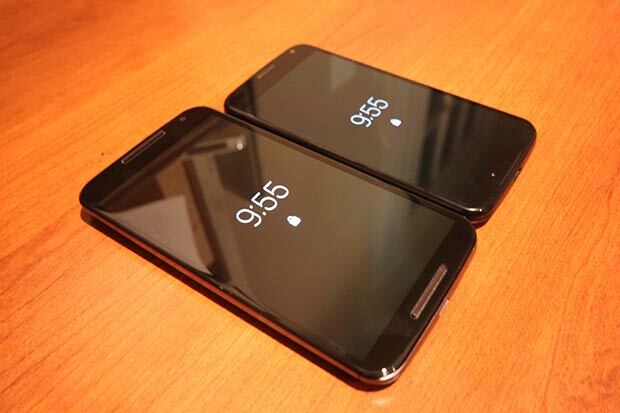 Bigger screen: The 4.7″ 720p screen on the Moto X 1st gen was upgraded on the second generation to a 5.2″ Full HD screen. The bigger screen looks amazing! More processing power: The 2.5 GHz quad-core processor is a nice upgrade from the previous generation's 1.7 GHz processor. Three times the processing power for your apps! Better GPU: The upgraded Adreno 330 graphics processing unit is 50% faster than the one on the 1st Generation. Better scratch resistance: The Corning Gorilla Glass 3 screen on the 2nd generation is more scratch resistant than the Corning Gorilla Glass 2 screen on the 1st gen. Better camera: The camera now has better Sony sensors, and an increase from 10MP to 13MP. The LED ring flash should help as well. Higher end finish: The second generation phone just feels more high-end with it's metal band around the exterior of the phone. The band also means better reception! 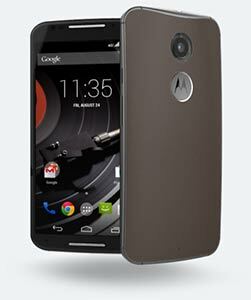 What phone plans are available for the Moto X on Republic Wireless? The cheapest plan when you signup is the base $10/month unlimited talk and text plan, which means you can make all the phone calls and send all the texts you want. You just won't have any mobile data to check your email or stream your favorite Pandora station. If you want data, you can add it in 1GB chunks for $15. Plans start at $17.50 for the XS 0.5GB plan, and go all the way to the $85/month XXL 5GB plan. $10/month base WiFi + Cell (talk & text only) plan: Unlimited talk and text on the Sprint network. Data only available on WiFi, no cell data. $17.50/month WiFi + Cell (talk, text and .5GB of 4G/3G data) plan: 500 MB of data every month, with upgrades to next level if wanted. $25/month WiFi + Cell (talk, text, 1GB of 4G/3G data) plan: 1GB of data every month, with upgrades to next level if wanted. $40/month WiFi + Cell (talk, text, 2GB of 4G/3G data) plan: 2GB of data every month, with upgrades to next level if wanted. $55/month WiFi + Cell (talk, text, 3GB of 4G/3G data) plan: 3GB of data every month, with upgrades to next level if wanted. $70/month WiFi + Cell (talk, text, 4GB of 4G/3G data) plan: 4GB of data every month, with upgrades to next level if wanted. $85/month WiFi + Cell (talk, text, 5GB of 4G/3G data) plan: 5GB of data every month, with upgrades for more data if needed. $5/month Wi-Fi only plan: You get no Sprint cell network usage with this basic plan. Wi-Fi calling only. I believe this plan is still available – I was using it for a time. The great thing about the Republic Wireless service plans is that not only do you get a calling plan at an affordable price, but you can also receive a refund for any extra mobile data that you don't use. For example, my wife and I are both low users of data since we don't do a lot of streaming of video or audio, and the 0.5GB $17.50 plan is more than enough for each of us. Neither one of us ends up using all of our data every month though – so instead of paying $35/month plus tax for both phones, we're actually paying closer to $30 after receiving our credits for unused data. Not many other providers will give you a refund for unused data! The service plans with Republic are flexible so if one month you need more data while you're traveling, you can add data to your plan, no problem. The next month if you need less data again, you can do that. 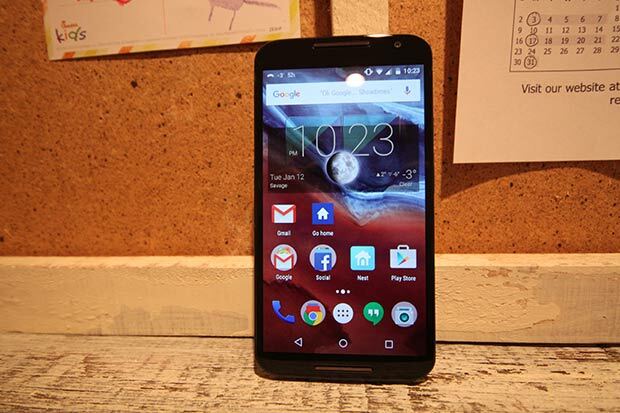 The Moto X 2nd generation has some cool features that are exclusive to Motorola phones. Moto Voice: Just say, “OK Google” and then give your Moto X a command. You can set a calendar event, send a text or find out the weather, without lifting a finger. Active Display and notifications: The phone can give you notifications on the lock screen that will help you save battery since you don't have to turn on the device to view them. It only uses pixels that are necessary to show the notification, and no more. You can set which apps can give notifications there, and in the end save quite a bit of battery during the day. Just press the lock screen and see the notification. Done. Twist your wrist to launch the camera: This feature seems a bit silly at first, but it has ended up being one of my favorite features from the previous generation phone that made it into the second generation. Just twist your wrist while holding the phone and the camera app will launch and you'll be ready to take a picture within seconds. No more missed photo opportunities! I've been using the Moto X 2nd Gen as my main phone for the past few days. 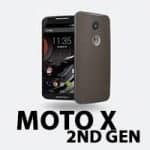 I came in a bit biased in that I already owned the first generation Moto X and loved it – and only upgraded to the second generation because my first phone met with an unfortunate accident. Now that I've been using the 2nd gen for a few days I can honestly say it is better in just about every way. The finishes on this phone are first rate, and it feels like a the top end phone that it's supposed to be. The 5.2″ Super AMOLED screen is even better than the screen on the previous generation, colors look great, and it is now Full HD! Wi-Fi and cell calling both work great, and a few small issues I had on the previous generation phone are no longer problems. Handovers from Wi-Fi to cell calls are seamless. Love the Moto Voice functionality (formerly called Touchless Control) that allows you to talk to the phone and have it do simple tasks or answer simple questions without the need to even pick up the phone. The Moto X should fit in well with my Amazon Echo speaker! The camera, and the photos it takes, are noticeably better. I also love the slow motion video capture, it's a fun new feature. As a happy owner of the Moto X first generation device I was bound to be happy with the new Moto X. The bigger screen, better processor, improved GPU, and higher end finish did not disappoint. The device is a high end smartphone, and can do just about anything you ask of it. The phone service from Republic Wireless is also top notch. Call quality is very good, and the new data refund plans make it even more affordable, especially if you're a low user of data like myself. If you're looking for an amazing phone, with an amazing service, I'd highly recommend checking out the Moto X 2nd gen from Republic Wireless. Disclosure: links on this page are affiliate links and we may receive a referral fee if you purchase through our links. High performance - It's fast! Phone almost too big to hold in one hand..
Our family has been extremely happy with Republic Wireless cell service and just ported our existing mobile phone numbers over to the service. Here's why. Last Edited: 13th December 2018 The content of biblemoneymatters.com is for general information purposes only and does not constitute professional advice. Visitors to biblemoneymatters.com should not act upon the content or information without first seeking appropriate professional advice. In accordance with the latest FTC guidelines, we declare that we have a financial relationship with every company mentioned on this site.